Those are fantastic things to be thankful for. In fact, we’re thankful for them too. But we’ve also got a list of other things that make us raise our arms, clap our hands, or generally show gratitude. Let us know if any of these are on your list too. We’ve all seen the images of what we’re doing to Mother Earth with our disposable, plastic water bottles (if you haven’t, google it and be prepared to be shocked). Tap.com offers a free app that maps out locations to refill your water bottle – saving money and the environment at the same time. Where else in the world can you spend a Friday sipping 25 cent martinis at lunch? If you’re new to NOLA, we suggest you make your reservations for next Friday now. After the demise of Hubig’s (….moment of silent reverence here….) there was a gaping hole in the New Orleans convenience store dessert rack. Haydel’s filled that gap when they debuted their hand pies a couple of years ago. While not *exactly* the same as Hubig’s, they are definitely the tastiest of the grab and go gas station pies. If you’ve never yelled BINGO at the top of your lungs and been rewarded with a whole turkey, you have no idea what you’re missing. Generally held in church halls around the city, turkey bingo is a New Orleans tradition that we have no intention of missing out on. The 125th lobby lighting is scheduled for November 27, 2018 at 5:15pm. 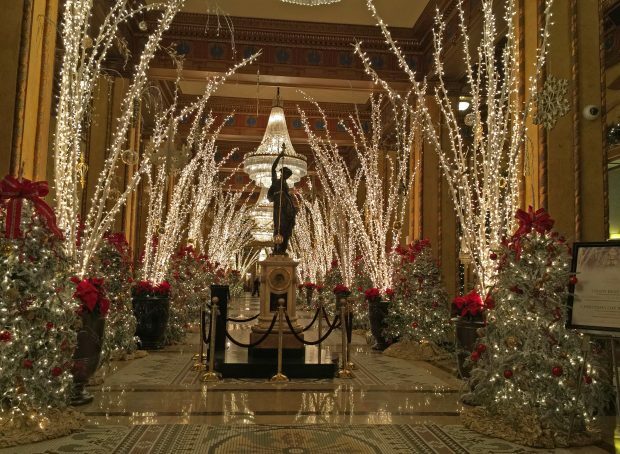 The Roosevelt Hotel is transformed into a holiday wonderland every year, and it’s our favorite place to grab a drink,sit, and people watch. The excitement of the little ones is enough to make even a Grinch’s heart grow. So…that’s our short list. What are you thankful for this year?